Owner: Vulcan Development Client: Busby, Perkins & Will Incorporating a series of innovative design charrettes, the GreenLab team and a panel of other local experts, involved in lab building design and construction, including Peter Busby and Bryan Croeni embarked on a self-funded, collaborative research effort to develop a highly functional and environmentally responsible biotechnology research facility. The team ultimately developed a prototype biotech lab design that incorporates a number of sustainability measures that maximize energy efficiency, conserve resources and provide a healthier, more appealing work environment. Detailed cost analysis showed a first cost premium pay pack in less than eight years. 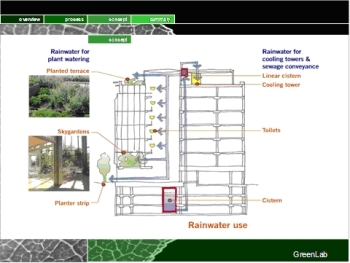 Civil design elements, designed and managed by Robin, included water reuse of 100 percent of the rain that fell on the property, green roofs, and increased tree densities in the adjacent street frontages. Building section image courtesy of Busby, Perkins and Will.